. . . Classical music in words. . . Welcome, classical music and dance lovers! This blog is for you, and contains news, reviews and fun facts from West Palm Beach, FL, and the arts world in general. Enjoy! I write free-lance about the arts and give talks at the Kravis Center before the classical Regional Arts concerts. As the former classical music and dance critic for the PALM BEACH (FL) POST, and before that, the Rochester (NY) DEMOCRAT AND CHRONICLE. I have covered music and dance as a journalist for 20+ years. My work has appeared in various publications and web sites: the STUART NEWS (Scripps Treasure Coast Newspapers, FL), AMERICAN RECORD GUIDE, the PALM BEACH (FL) DAILY NEWS, the SOUTH FLORIDA CLASSICAL REVIEW.com as well as my blog, CLASSiWords.blogspot.com. I speak to groups because I want everyone to understand that the arts -- especially music -- can be life-changing. You'll hear that at my pre-concert talks at the Kravis Center's Regional Arts series in 2010-2011, as well as my classes at the Society for Lifelong Learning, Florida Atlantic University, in Jupiter. I was privileged to be on the ground floor of the PALM BEACH ARTSPAPER.com, the newest and best site to cover the arts in Palm Beach County. Working with my highly creative former POST co-workers makes an otherwise daunting enterprise continuously fresh and fun. Jan. 13, 2010, at 8 p.m.
Ballet Florida, the resident contemporary and classical ballet company of West Palm Beach, announced on July 4 that it would cease to exist after 23 years. Artistic Director Marie Hale and her staff will focus their efforts to open a new nonprofit school in September in a new location to be announced. It's sad news after the long, hard struggle fought by the staff to keep the company afloat. In March, Ballet Florida canceled the remainder of its 2008-09 season for lack of funds. The company of 20 included dancers from France, Cuba, Chile, Spain, Brazil and Venezuela, as well as the United States. Ballet Florida was known for its intriguing and imaginative repertoire, from full-length story ballets, to major historic works to modern ballets by top and emerging choreographers. 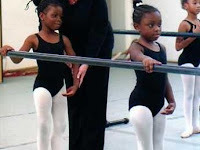 As well, the company taught dance to youngsters who might never get the opportunity to learn ballet. 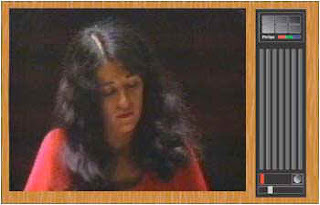 As luck would have it, I sit watching a DVD of the great pianist Martha Argerich. She plays Ravel's Jeux d'eau with such beauty, delicacy and ease that I'm awed. The DVD is from 1977, a Canadian Broadcasting Corporation telecast featuring the 36-year-old Martha that lives on. As I read the program notes, I realize that Argerich was born June 5, 1941, and my DVD is due back to the library on her birthday. Ah, lovely coincidences. Her Liszt Funerailles is powerful, but still less commanding than I'd prefer. Here her playing is exciting, yet it lacks something: a depth, a heightened sense of color and nuance -- that is, Argerich's hallmarks. I instantly forgive her as I listen to the Jeux d'eau for a second, third and fourth time. The program opens with Schumann's Piano Concerto in A Minor (Conductor Franz-Paul Decker leads the Radio-Canada Orchestra), and here the poetry just ripples off her fingers. The tempo is fast but hearty, nothing fluffy or breezy. Here is the earnest Martha; she lets escape only one brief, tiny smile during the performance. Flashy mannerisms she leaves to someone else who might need them. Here the music is all-important. And even though I'm not fond of Schumann (oooh, did I really admit that?!? ), I'm compelled to listen to her. Not that I don't know what comes next, but I don't know what she will do next! Her turns of phrase, her choice of what to highlight, it's such a sense of spontaneity, joy and adventure. Here's Schumann even a detractor could love. Although I've never been fortunate enough to catch one of her live performances, I count Martha Argerich as one of the Top 10 living pianists. Thanks for the hours of rapture, Martha, and Happy Birthday! Vocally and musically, the singing on Saturday afternoon was really first rate and often exquisite. Aside from the Latvian mezzo-soprano who could do no wrong, Elina Garanca in the title role, I was formally introduced to a major rising star that I knew by name only, African-American tenor Lawrence Brownlee as Prince Charming. And I'll give the conductor Maurizio Benini a B+ only because at times, the action just seemed to stop for yet another requisite show-off aria, although most of the time, the opera bounced right along in the crucial vocal ensembles. Benini even upshifted to turbo as if daring the vocal ensemble to keep on track (they did, mostly). I tremendously enjoyed the supporting actors and the irony they presented. Baritone and comic actor Alessandro Corbelli was a rascal, a bully and even a sympathetic figure at times as the idiot Stepfather, Don Magnifico -- Rossini's answer to the hateful Stepmother. And instead of a Fairy Godmother, Rossini offers us the equally sympatethic Alidoro, Cinderella's guardian angel, sung in an angelic bass by the young, newly named Beverly Sills Award Winner, John Relyea. The ever-cavorting ugly stepsisters sang well, that is, if you noticed their singing over the shenanigans that began well enough, but grew more tiresome as the three hours wore on. Far better as a comedian was bass-baritone Simone Alberghini as Dandini, the valet-in-prince's-clothing. But compared to other Met productions, Caesare Lievi's 1997 design dates itself for its limited compatibility with what HD film/television has to offer. There seemed to be far fewer cameras, and those were focused front-on. In the finite, box-y set -- very much like looking into the fireplace by way of the front grate only -- we got lots of close-ups. There were also views of several backstage scenery changes, but little else. In effect, we saw mostly what the Lincoln Center audience saw as opposed to productions that have captured side angles and views from different perspectives. HD movie-goers got little of that being-in-the-center-of-the-action feel. I'm sure that my disappointment lies in part from realization that this season-ending Saturday matinee of Cenerentola is the one and only HD satellite production, out of the Met's 11 this season, that I've managed to see. So I was pretty well starved for stimulation by the time I took my seat at Royal Palm Beach's Regal 18. So with Cenerentola's rather "flat" set and costumes -- bare, plain, minimalist even -- and the prominent lack of great detail, even the close-ups had limited effect. Compared to the wealth of stage and costume ornamentation in, say, "I Puritani" last season, the visuals were a let-down. That seems like quite an oxymoron considering that Cinderella is a fairytale, and the over-embroidered Disney version has surely affected my mental image. Nor did the designers go with another obvious choice: plain and simple for her "lean" days, ornate and fanciful after the transformation (the ball, the wedding). But in this new artform called Live HD Opera, perhaps there are other artists to consider, like the cinematographer who must interpolate an older production into newer techniques, showing off its strengths, not its limitations. And does s/he play well with others, like the lighting designer? The most obvious example of a mismatch was revealed in Cinderella's all-important ballgown. I've seen better still photos after the fact, images that offered richer, more intriguing details, than I could catch during the broadcast. And what of that little ol' decision-maker -- finances? As the Met's season closer, how much money was left in the budget to address which priorities? Maybe the just-shut-up-and-enjoy-whatever-you-can-get rule applies here. Famed baritone Thomas Hampson was the backstage host -- we've all seen him do better. He was stiff, mixing up the names of the singers in front of him, even narrowly missing a flub of Angela Gheorghiu's last name. He didn't rise to the ever-so-engaging speaker he is during interviews or when talking from stage to an audience about his solo program. On today's date (April 18) in 1882, a child was born in London to a Polish father and Irish mother -- a baby christened Leopold Boleslawowicz Stanislaw Antoni Stokowski. In 1882, Brahms completed his Second Piano Concerto and Wagner introduced his last opera, "Parsifal"; Gustav Mahler was a promising opera conductor aged 22; Richard Strauss was a young man of 18; Arnold Schoenberg a lad of seven; and Igor Stravinsky still a few months away from being born! Leopold Stokowski would grow up to become a famous conductor of all those composers' works. For 25 years, Stokowski led the Philadelphia Orchestra in an astonishing variety of music, ranging from his own dramatic symphonic arrangements of works by J.S. Bach to cutting-edge, avant-garde works of Edgard Varese and dozens of other contemporary composers. Stokowski cut a glamorous figure on stage and off, hung out with movie stars, and played himself in a 1937 movie, "100 Men and a Girl." He shook hands with Mickey Mouse in Disney 's animated classic "Fantasia," and Bugs Bunny did a devastating Stokowski imitation in a famous Warner Brothers cartoon. For some, his flamboyance was hard to take, but the list of old and new music Stokowski performed before his death in 1977, at the age of 95, remains as impressive as his recorded legacy, which continues to live on via compact disc reissues. On Tuesday, April 21 (Yom Ha Shoah), Performance Today, the nationally syndicated classical music radio program, will present selections from a major new choral work: Kaddish, written and composed by Lawrence Siegel. Kaddish is an hour-long oratorio for chorus, soloists and chamber orchestra, whose libretto is fashioned from the testimony of survivors of the Holocaust. Kaddish tells their stories in their own words, providing a window into their lives, allowing us to share their experience directly. As the youngest of the survivors approach their eighties and nineties, this window is beginning to close. Kaddish will allow us to hear their voices forever. The world premiere of Kaddish took place in Minneapolis, MN, on November 15th, 2008, given by VocalEssence, under Philip Brunelle. On November 18th, 2010, a full symphonic version will be premiered by the Houston Symphony and Houston Symphony Chorus. In the period leading up to that performance, a series of significant workshops and presentations will feature the composer and Holocaust survivors. These activities will be produced by Holocaust Museum Houston in partnership with the Houston Symphony. Here's where I want to live and write some day. 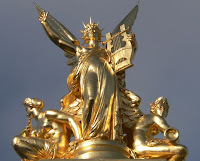 Paris, the City of Lights; the most exquisite place on earth. In my first visit, as a music student in 1967, I felt I was home, more at home than I ever felt in my home town. The sounds, sights, tastes were astonishing -- and I remembered for decades, perhaps too well. So I returned to Paris in 1996. And yes, the myth is true. April is Paris is enchanting. I recognized that my memories hadn't been overly rosy, my initial impressions held. I was still in love with a city. Now I need not only passion, but also a plan to turn dreams into a destination.